Do you know "what's in your soup"? Today's hazardous waste manager realizes that there are thousands of events central to managing waste inventory effectively. From a simple ship-in, to a merge of containers into a tank, or a split of waste, tracking waste is critical for compliance. TDX Inventory allows you to track and manage hazardous waste inventory events easily and efficiently. TDX Inventory technology offers you unlimited capacity to chart the history of your material flow, and automatically ship in hazardous waste inventory from a manifest. You can specify as many storage areas or levels of storage as you want, and as many containers as you need. Consolidate waste from multiple containers into one. Split waste from one container into many and accurately track the original constituents. Move multiple containers between storage areas. Split waste stored in the same container and track the waste codes. 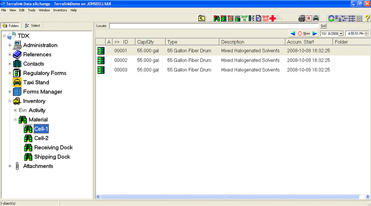 Create complex lab packs with packing slips and detailed reports. Automatically create a manifest for outbound shipment. TDX Inventory gives you access to a myriad of reports, and allows you to schedule future events, and look back in time to view inventory throughout the entire treatment, storage or disposal process - just by a simple calendar select. Coupled with a myriad of reports, your management job just became more efficient than ever. Contact us today to see what TDX can do for you.